It’s been four years since I said I do and every year I learn more and more what those words really mean. I do want to be the best person that I can be. I do want to learn from my mistakes. I do want to grow with you and learn these valuable life lessons right by your side. I do what I can do and so do you. I do know that you accept me flaws and all. I do love you to the depths of the earth. I do thank you for making me a mother, which is the most treasured gift that I have ever been given. I do know that you sacrifice everything so that the kids and I can have everything we need and want. I do respect the man you are, as you are setting such a high bar for our sons. I do know that you are our protector and that you are doing everything in your power to make sure that we see nothing but positivity in our lives. I do enjoy your company above all others. I do love just being in the same room as you, even if words aren’t being exchanged. I do love dreaming of our future together, even if things don’t work out exactly as planned. I do not imagine a life where you aren’t in it because one of the best things in my life is you. Happy fourth anniversary to the man that I said I do to and will continue saying I do to for all of our time to come. Being in my thirties, being married and being a mother has made me reevaluate a lot of things and people in my life. 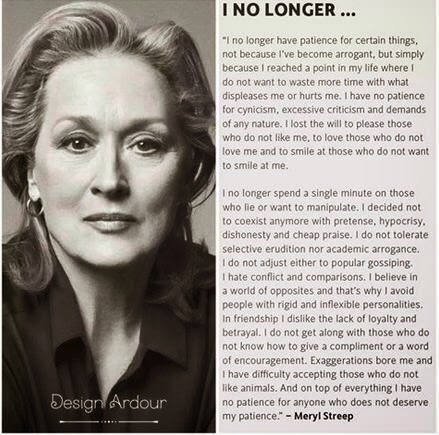 Thank you Meryl Streep you magnificent human being.